An unaltered photocopy of your DD-214 or other military issued document clearly displaying your award of the Southwest Asia Service Medal. Contact The War Library if you do not have a DD-214: 1-562-422-4100 (Pacific Time Zone). 1. Description: A bronze medal with enamel, 1 9/16 inches in diameter suspended from a bar by a wreath. The obverse bears the Coat of Arms of the State of Kuwait. The Coat of Arms consists of the shield of the flag design in color superimposed on a falcon with wings displayed. The falcon supports a disk containing a sailing ship with the full name of the State written at the top of the disk. At the top of the medal is the inscription "1991 LIBERATION MEDAL" in Arabic letters. The reverse side is the map of Kuwait on a rayed background. 2. Ribbon: The ribbon is the pattern of the flag of the State of Kuwait and consists of three equal stripes 29/64 inch each of the following colors: Old Glory Red 67156; White 67101; and Irish Green 67189. A black trapezium is at the top of the ribbon drape and service ribbon. d. serving on temporary duty for 30 consecutive days or 60 nonconsecutive days. These time limitations may be waived for members participating in actual combat operations. a. Medal (regular size): Initial issue and display items available commercially. b. Medal (miniature size): Available commercially only. c. Service Ribbon: Available commercially. 5. Background: a. The Government of Kuwait offered the Kuwait Liberation Medal to members of the Armed Forces of the United States by letter dated 16 July 1994. The medal was accepted by Secretary of Defense William J. Perry per memorandum dated 16 March 1995.
b. A nation of seafarers and ship builders, Kuwait chose as their coat of arms, the traditional dhow. Falconry is the sport of Kings in the Persian Gulf, and the falcon in the arms is seen as a symbol of Kuwaiti prowess. The official symbolism of the colors is black symbolizes battlefields, white is for deeds, green is for the meadows, and red is for the blood of Kuwait enemies. c. The wear of foreign service medals is prescribed in Army Regulation 670-1. 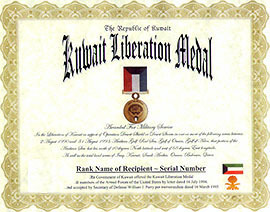 The Kuwait Liberation Medal from the Government of Kuwait will be worn immediately following the Kuwait Liberation Medal from the Government of Saudia Arabia. This award, authorized by the Government of Kuwait to members of the U.S. military who participated in Operation DESERT SHIELD and DESERT STORM and the Liberation of Kuwait. The Secretary of Defense Memorandum, 16 March 1995, authorized the acceptance and wearing of the Kuwait Liberation Medal by members of the Armed Forces of the U.S.
To be eligible for this award, U.S. military personnel must have: Served in support of Operation DESERT SHIELD and DESERT STORM between 2 August 1990 and 31 August 1993, in one or more of the following areas: The Persian Gulf; Red Sea; Gulf of Oman; that portion of the Arabian Sea that lies N of 10 degrees N latitude and W of 68 degrees E longitude; Gulf of Aden; or, the total land areas of Iraq, Kuwait, Saudi Arabia, Oman, Bahrain, Qatar, and United Arab Emirates. Please refer to DoD 1348.33-M for specific individual eligibility requirements. The Kuwait Liberation Medal (Kuwait) is authorized by the Government of Kuwait to members of the United States military who participated in Operations DESERT SHIELD and DESERT STORM. Secretary of Defense Memorandum "Acceptance of Foreign Awards in Recognition of Active Field Service in Time of Combat Operations," (Kuwait Liberation Medal-K) dated 16 March 1995 authorizes acceptance and wear of the medal by United States Armed Forces personnel. The total land areas of Iraq, Kuwait, Saudi Arabia, Omar, Bahrain, Qatar, and the United Arab Emirates. That portion of the Arabian Sea north of 10 degrees north latitude and west of 68 degrees east longitude. Attached to or regularly serving for one or more days with an organization participating in ground and/or shore operations Attached to or regularly serving for one or more days aboard a naval vessel directly supporting military operations. Actually participating as a crew member in one or more aerial flights supporting military operations in the areas designated above Serving in temporary duty for 30 consecutive days or 60 nonconsecutive days during this period. This time limitation may be waived for people participating in actual combat operations. The KLM-K may be awarded posthumously. The KLM-K follows the Kuwait Liberation Medal from the Government of Saudi Arabia (KLM-SA) in precedence. 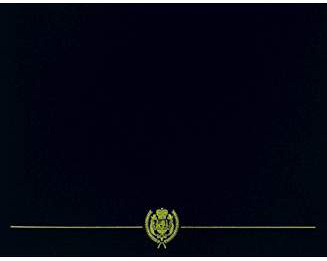 See Chapter 7, DoD Manual 348.33-M, Manual of Military Decorations & Awards for further information. In August of 1995, the Secretary of Defense accepted an offer by the Government of Kuwait to award the Kuwait Liberation Medal to members of the U.S. Armed Forces who participated in Desert Shield/Desert Storm between Aug. 2, 1990 and Aug. 31, 1993. Service members must have participated in one or more of the following areas: Arabian Gulf; Red Sea; Gulf of Oman; that portion of the Arabian Sea north of 10 degrees north latitude and west of 68 degrees east longitude; the Gulf of Aden; or the total land areas of Iraq, Kuwait, Saudi Arabia, Oman, Bahrain, Qatar and the United Arab Emirates. These eligiblity periods and locations have been specified by the government of Kuwait and may not be waived. In addition to those requirements, Navy members must meet one or more of the following conditions: been attached to or regularly serving for one or more days with an organization participating in ground/shore operations; or been attached to or regulary serving for one or more days on board a naval vessel directly supporting military operations; or been actually participating as a crew member in one or more aerial flights supporting military operations in areas designated above; or been serving on temporary duty for 30 consecutive days during the period Aug. 2, 1990, to Aug. 31, 1993, in any of the three capacities listed above. This time limit can be waived for personnel participating in actual combat operations. The Kuwait Liberation Medal is awarded by the Government of Saudi Arabia to members of the Armed Forces of the United States and authorized by Department of Defense on 3 January 1992.
a. It was awarded to members of the Armed Forces of the U.S. who participated in Operation DESERT STORM between 17 January 1991 and 28 February 1991 (amended 2 August 1990 to 31 August 1993) in one or more of the following areas: Persian Gulf; Red Sea; Gulf of Oman; that portion of the Arabian Sea that lies north of 10 degrees north latitude and west of 68 degrees east longitude; the Gulf of Aden; or the total land areas of Iraq, Kuwait, Saudi Arabia, Oman, Bahrain, Qatar, and the United Arab Emirates. (1) Be attached to or regularly serving for one or more days with an organization participating in ground or shore operations. (2) Be attached to or regularly serving for one or more days aboard a naval vessel directly supporting military operations. (3) Actually participate as a crew member in one or more aerial flights supporting military operations in the areas designated above. (4) Serve on temporary duty for 30 consecutive days during the period 17 January 1992 to 28 February 1992 under any of the criteria in (1) through (3) above. This time limit may be waived by HQ, PERSCOM (TAPC-PDA) for people participating in actual combat operations. c. The eligibility period and geographic boundaries were specified by the Government of Saudi Arabia and may not be waived. d. Posthumous award to the next of kin of any soldier who lost his or her life, while, or as a direct result of, participating in Operation DESERT STORM between 17 January 1991 and 28 February 1991 (amended 2 August 1990 to 31 August 1993), without regard to the length of such service, will be made by HQ, PERSCOM (TAPC-PDA). e. The Kuwait Liberation Medal, ribbon, and miniature medal are items of individual purchase. An initial issue to eligible personnel from a one-time stock provided by the Government of Saudi Arabia was accomplished by the Army in 1992. The issue period from the gold content GOSA medal, 17 January 1991 and 28 February 1991 has not been extended. Do not apply to the GOSA for issue. This award, authorized by the Government of Saudi Arabia to members of the Coalition Forces who participated in Operation DESERT STORM and the Liberation of Kuwait. The Deputy Secretary of Defense Memorandum, 7 October 1991, authorized the acceptance and wearing of the Kuwait Liberation Medal by members of the Armed Forces of the U.S.
To be eligible for this award, U.S. military personnel must have: Served in support of Operation DESERT STORM between 17 January 1991 and 28 February 1991 (amended 2 August 1990 to 31 August 1993), in one or more of the following areas: The Persian Gulf; Red Sea; Gulf of Oman; that portion of the Arabian Sea that lies N of 10 degrees N latitude and W of 68 degrees E longitude; Gulf of Aden; or, the total land areas of Iraq, Kuwait, Saudi Arabia, Oman, Bahrain, Qatar, and United Arab Emirates. Please refer to DoD 1348.33-M for specific individual eligibility requirements. 1. Description: The medal is 1 25/32 inches in width and is described as follows: On a Gold sunburst with stylized Silver rays, a globe depicting the Arabian Peninsula encircled by a wreath of palm between a scroll in the base inscribed "LIBERATION OF KUWAIT" and at the top a palm tree issuing from two diagonally crossed sabers, all Gold. 2. Ribbon: The ribbon is 1 3/8 inches wide and consists of the following stripes: 5/32 inch Old Glory Red 67156; 5/64 inch Black 67138; 9/64 inch White 67101; center 5/8 inch Irish Green 67189; 9/64 inch White; 5/64 inch Black; and 5/32 inch Old Glory Red. 3. Criteria: a. Members of the Armed Forces of the United States must have served in support of Operation Desert Storm between 17 January 1991 and 28 February 1991 (amended 2 August 1990 to 31 August 1993)in one of the following areas: Persian Gulf; Red Sea; Gulf of Oman; that portion of the Arabian Sea that lies north of 10 degrees North latitude and west of 68 degrees East longitude; the Gulf of Aden; or the total land areas of Iraq, Kuwait, Saudi Arabia, Oman, Bahrain, Qatar, and the United Arab Emirates. (2) attached to or regularly serving for one or more days aboard a naval vessel directly supporting military operations. (4) serving on temporary duty for 30 consecutive days during this period. This time limitation may be waived for people participating in actual combat operations. 4. Components: The following are authorized components and related items. a. Medal (regular size): (Initial issue provided by Kingdom of Saudi Arabia) MIL-DTL-3943/244. NSN 8455-01-349-7517.
b. Medal (miniature size): MIL-DTL-3943/244. Available commercially. c. Ribbon: MIL-DTL-11589/75 with ribbon attachment. Available commercially. 5. Background: a. The Kuwait Liberation Medal granted by decree of the King of Saudi Arabia, dated 23-10-1411H, was accepted by the Deputy Secretary of Defense per memorandum dated 7 October 1991, subject: Acceptance of Foreign Award in Recognition of Active Field Service in Time of Combat Operations. b. A gold device consisting of two crossed sabers and a palm tree is affixed to the service ribbon. c. The sunburst symbolizes the light of freedom. The globe, depicting the Arabian Peninsula, denotes the theater of operations and is encircled by palm, denoting victory. The palm tree with crossed sabers is the emblem of the Kingdom of Saudi Arabia. Green, red, white and black are the colors of the flag of Kuwait. Green and white are colors in the flag of Saudi Arabia. d. The wear of foreign service medals is prescribed in Army Regulation 670-1. The Kuwait Liberation Medal from the Government of Saudia Arabia will be worn immediately following the Republic of Vietnam Campaign Medal. WASHINGTON (NNS) -- Eligibility requirements and regulations for wearing the new Kuwait Liberation Medal (Kuwait) (KLMK) by Navy members were recently announced by the Secretary of the Navy Awards Board. In August, the Secretary of Defense accepted an offer by the Government of Kuwait to award the KLMK to members of the U.S. Armed Forces who participated in Desert Shield/Desert Storm between Aug.
2, 1990 and Aug. 31, 1993. Service members must have participated in one or more of the following areas: Arabian Gulf; Red Sea; Gulf of Oman; that portion of the Arabian Sea north of 10 degrees north latitude and west of 68 degrees east longitude; the Gulf of Aden; or the total land areas of Iraq, Kuwait, Saudi Arabia, Oman, Bahrain, Qatar and the United Arab Emirates. -- been serving on temporary duty for 30 consecutive days during the period Aug. 2, 1990, to Aug. 31, 1993, in any of the three capacities listed above. This time limit can be waived for personnel participating in actual combat operations. In order of precedence, the KLMK will be worn after the Kuwait Liberation Medal from the government of Saudi Arabia. Effective immediately, commanding officers are authorized to award the KLMK to qualified personnel, citing NAVADMIN 291/95 as authority. (1) Established by the Government of Saudi Arabia and accepted by the Deputy SECDEF on 3 January 1992. (d) serving on temporary duty for 30 consecutive days during the period 17 January to 28 February 1991 (amended 2 August 1990 to 31 August 1993)under any of the criteria above. This time limit may be waived for personnel participating in actual combat operations. (3) Determination of Eligibility and Record Entries. Commanding officers shall determine eligibility upon review of the individual's service record and are authorized to issue the award. Commanding officers shall make appropriate service record entries for eligible enlisted personnel and issue letters of eligibility for eligible officer personnel. Copies of the letters to officers shall be forwarded to the BUPERS (PERS- 313C) for filing in the officer's record. No citation or certificate will be issued. The eligibility period and geographic boundaries were specified by the Saudi Government and may not be waived. (1) Established by the Government of Kuwait and accepted by the Deputy SECDEF on 7 August 1995. (d) serving on temporary duty for 30 consecutive days during the period 2 August 1990 to 31 August 1993 under any of the criteria in (a), (b), or (c) above. This time limit may be waived for personnel participating in actual combat operations. 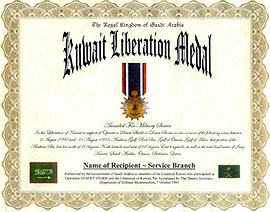 Note: The Kuwait Liberation Medal (Kuwait) may be awarded posthumously to the primary next of kin of any service member who lost his/her life while, or as a direct result of, participating in Desert Shield/Desert Storm between 2 August 1990 and 31 August 1993, without regard to length of service, if otherwise eligible.